you know, everywhere i go, one of the first things people tell me about my knitting blog is how much they enjoy my garden, haha. and i love that! today, i have an extravaganza for you garden fans—it’s opening day for the vegetable garden, folks. the first thing i did when i woke up on friday morning was to take a tour of the yard; i felt like i probably missed a lot when i was away. after so many days of rain, it was sparkling that morning under long-overdue sun. 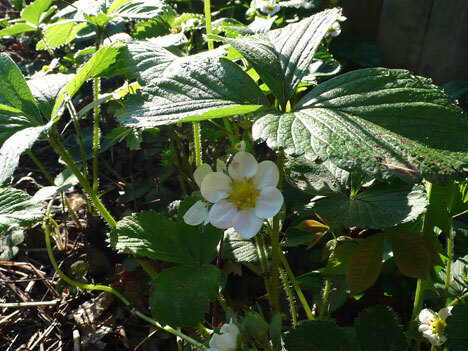 the strawberries, which showed no signs of even a bud when i left, were in full bloom. 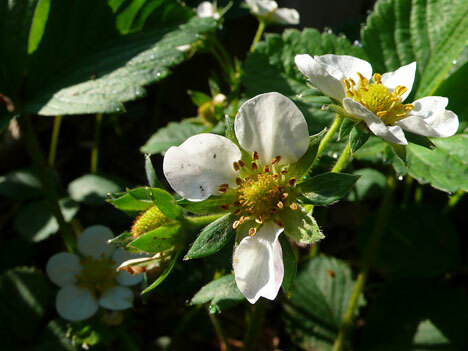 a few flowers even sported tiny fruits at their centers. sweeet! 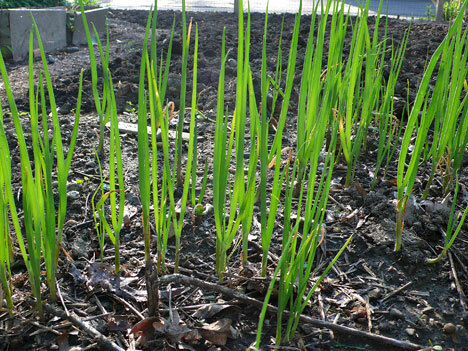 these scallions that wintered over from last year have now sprouted hardy tops in place of the desiccated ones that lay on the snow a couple of months back. and the bulbs beneath are sweet and tasty; perfect for adding to quiche or stir fry (and the very first harvest of 2011). 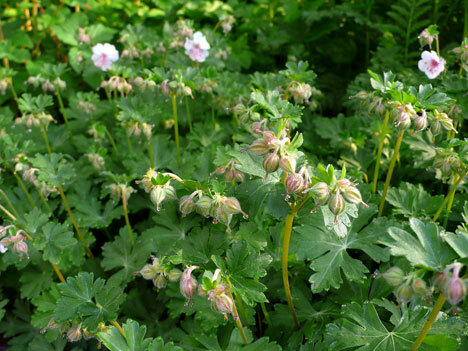 this cranesbill sanginaria is loaded with buds, still bearing the evidence of all-day showers on thursday. and that asparagus bed was looking fantastic—looks like almost every plant came back, tall and strong—some as tall as four feet already. we’ve cut a few stalks to eat, but this being only the second year, left the rest to flower and go to seed. next year, we can feast more liberally on the results of our patience, if indeed, it is rewarded as we hope . 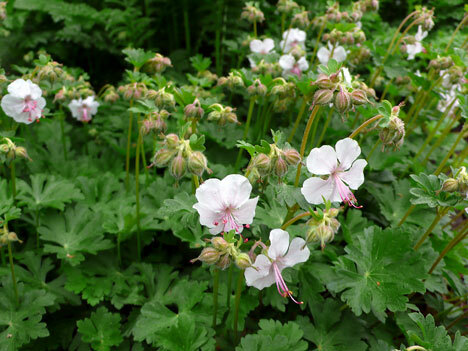 . .
look at how pretty it is close up, with its tinge of pale pink around the rim. i think this is the female flower, but i’m not sure; i’ll have to look it up later. 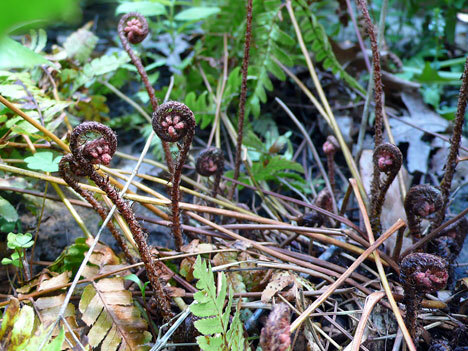 from the winter’s green fronds, these dark red fiddleheads have begun to unfold. they will open up in flaming october colors and stay that way until it’s nearly fall, when they finally turn to green for the winter. they really brighten up the corners of the shade bed nicely. i had hoped to actually get out to work in the garden on friday (and i should have), but since it was my first day home, i had several pressing matters to take care of elsewhere. i had a pattern to write up, for one thing. and the ankle which had been bothering me the whole time i traveled was so inflamed by this time, that i was actually afraid to put it to work in the yard. i’m not sure where this came from as i’ve never been delicate that way, but off to the chiropractor we went, to get it adjusted. on the way home though, we stopped off to buy plants at one place and to pick up plants that my friend kris started for us as well. i then had everything i needed to get a good, early start the next day. nothing like a nice, blank canvas at 7am, eh? 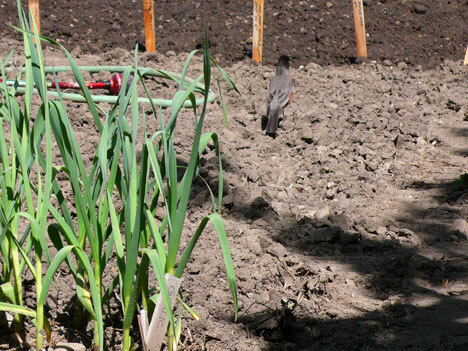 except for those scallions, the garlic, and my oregano patch, our vegetable plot was looking quite free of growth, with newly-turned dirt which had a full day to dry out a bit in the sun. the texture was perfect by saturday morning. 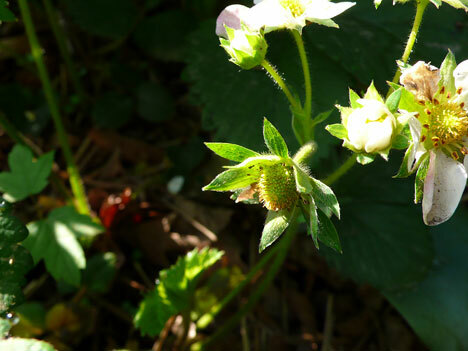 according to the biodynamic planting calendar, friday and saturday were “fruit” days—everything was aligned for good results in planting fruit-bearing plants. i started at the back corner therefore, with the tomatoes, eggplant, and pepper plants, several varieties of each (i’m a junkie for trying different types of plants). i cut way back on the fruit-bearing plants this year, in order to have space for more root vegetables, which i became enamored of growing last year. 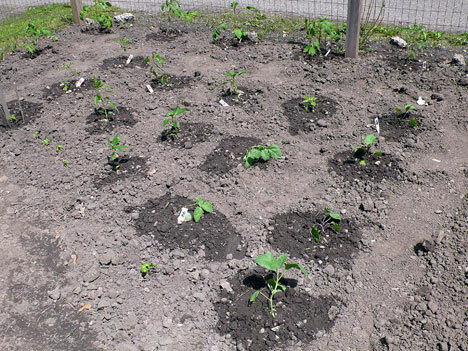 i just hope that the ones i did plant take off and thrive; otherwise, we might not get enough tomatoes for winter . 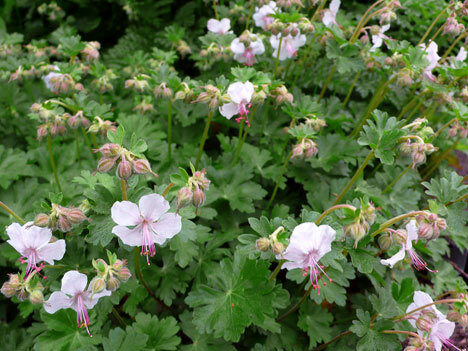 . .
for the rest of the garden, i had a carefully drawn-out plan, devised over months and months of diagramming . . .
ok, not really. i always mean to do that over the winter, but then i never do; i must actually prefer on-the-spot decision making. 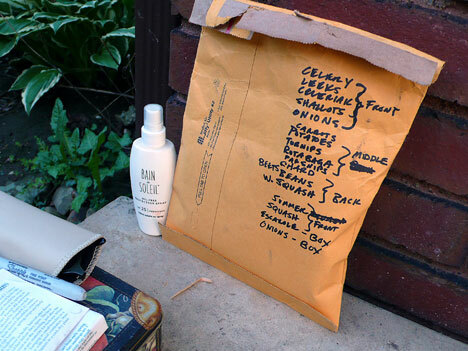 pretty much though, this list on the back of the seed envelope was what made it into the garden and more or less in the arrangement shown here. 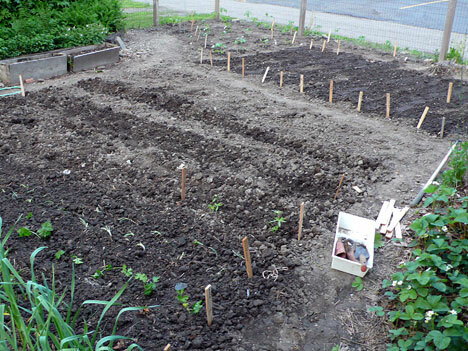 i did the back seed bed next, where all the green, leafy vegetables were seeded in. that is the sunniest part of our fairly well-protected the garden. the last time i had greens in this spot, they produced to beat the band. we’ll see if it works on our favor this year. i drew out some rows (twelve) and seeded them in one at a time, alternating chard with green beans, beets, turnips, and collards. i did not put in okra this year; it was pretty, but didn’t produce well for me last year, so i decided against it. 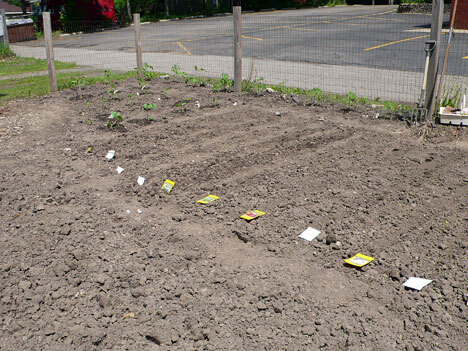 after i got all the seeds in, i posted each row with the variety and thinning info, because far be it from me to actually hang on to the seed packet . .
after that i watered, just to dampen the seeds. the ground was already wet enough—so much so, that it took all day in the sun to even show signs of beginning to dry—but the seeds needed wetting. hahaha, which was just what this robin was waiting for—nice damp earth that would bring worms to the top. i can’t tell if it’s a male or female (my gut says male, but i dunno), but this guy was in the garden ALL day with me. seriously?? 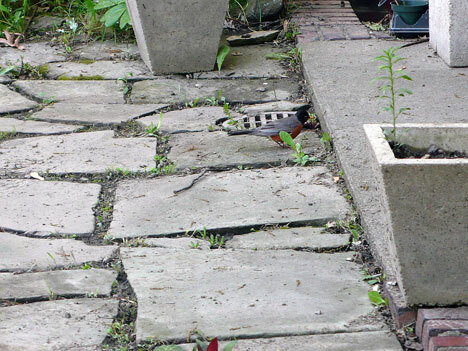 looking for worms on the flagstone? c’MON—even i don’t believe that, not when all that soft, squishy, damp earth is awaiting your perusal. not when i see you every other five minutes with your beak just stuffed with worms. HA! i am, after all, the person who planted summer squash yet again this year, when i know full well it almost certainly won’t make it. 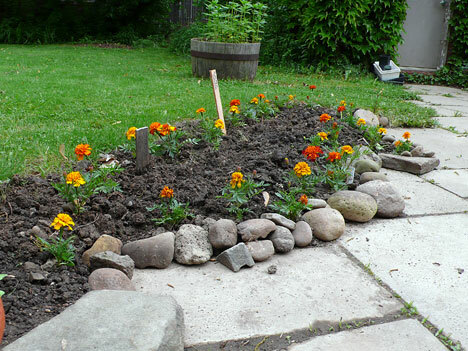 i’m trying to guard it with a ring formation of marigolds and nasturtiums (i still have to buy those), but i will be the first to be surprised if that works. we shall see. by the time i got all the seeds in the ground it was late afternoon and my stomach was growling. i still had all of the root vegetables to plant and as luck would have it, saturday evening was the beginning of a “root” cycle. so i ate some lunch, puttered around putting in marigolds, and planted some ornamentals while i waited for 6pm to roll around. i actually ended up cheating just a little by starting to put the root stuff in around 5—i was getting worried that my energy wouldn’t last. by the last of the evening light, i had everything in—shallots, leeks, celeriac, onions, potatoes, sweet potaotes, rutabaga, parsnips, and carrots. i love the root vegetables—you put them in the ground and that’s it until fall. the ones that are seeded in just need to be thinned at the appropriate time, but really, that is a small amount of work. i planted all of the root crops quite close together, so that the tops would from a canopy and keep the weeds down. since i don’t have to harvest them, i shouldn’t need to walk between the rows or get near the plants much. we’ll put down our usual newspaper and straw mulch in a week or two, once all the seeds have sprouted and we can see where the rows will be. the garden boxes got seeded in with escarole and red onions; i’m not sure how well they’ll do in there, but maybe ok; the peppers i had in them last year did very well. over the course of that day, the cranesbill i showed you earlier opened one flower after another—a real treat to watch and photograph. by tomorrow, they should all be fully open. you might think that with all that outdoor activity, i didn’t get any knitting done this weekend, but actually, i did get some rows knit. and i have some progress to show as well from my last few days on the road. 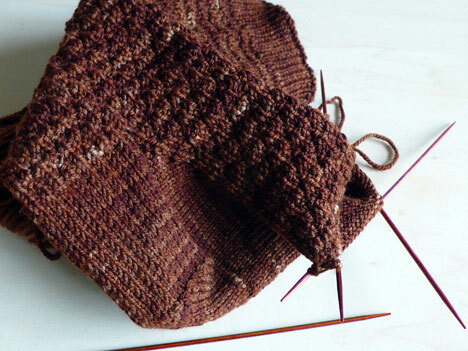 i am so close to finishing this sign of four sock, i can taste it. one more car trip or plane ride and i’ll be closing the toe before i land. i’ll probably take it along to TNNA in june to finish it up. or maybe even to the great lakes fiber show next weekend; i can work on it while i visit in the briar rose booth (woo-HOO, i’m gonna see chris!). anyway, this has been a long time on the needles and i’m glad it’s almost done—this will be my first finished pair of socks for this year, can you believe that?? not that i don’t have several more underway—they’re just all old projects. and i’ve promised myself i won’t start another new one til the WIP sock are done. for instance, before jen and i decided that the sign of four sock should be part of the victorian writers club, i had started it as an independent project in this beautiful string theory caper sock yarn, a gorgeous, merino/cashmere/nylon blend in colorway fusion. by the time we hijacked the design for the club, i had too much of the leg done to rip it out. so i left it on the needles in waiting. i worked on it here and there, but there is still a long way to go on this pair. once those brown ones are done, the reds will take their place as travel socks. 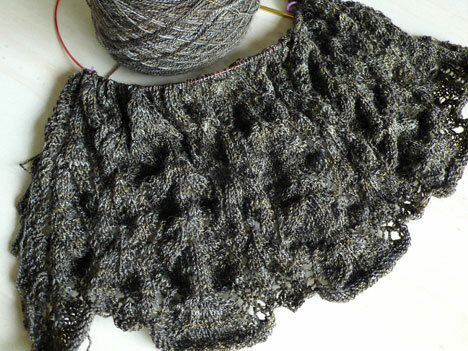 this oval lace scarf is such easy, take-along knitting that i put quite a few inches on it during my trip. and the sweet georgia cashsilk is so luscious, you just don’t want to be away from it for long. it sounds trite, but everyone who touches it literally gasps. and of course, the next person is sure they won’t, then they touch it and THEY gasp. it’s involuntary, i swear . . . and a little indecent, actually. there’s no way i can describe it, even face to face—you have to touch it. those who have and are reading this, please speak up and back me here . . . (you know who you are). 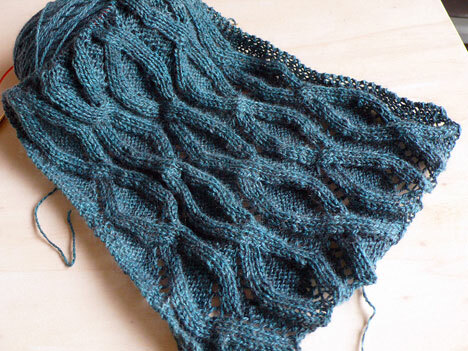 as delicate as an insect wing, this leaf lace stole is growing more slowly, but surely. i would love to have this done to wear to james’s wedding in september, so i’m going to have to knit faster. and in better light. priorities, priorities . . .
i also have a few secret projects; more than i like to have at one time. some of these will be off my desk very soon and some will be with me for a bit. and of course, the ones for our own club (but those are the fun ones, hee-hee. don’t tell anyone i said that). thank you SO MUCH for your enthusiastic response to the club; signups have gone so well and we are nearing capacity. we’ve capped the number of available spots at 550 (including extra yarn options), which means we have just 50 or so left to sell. i think that deserves flowers, don’t you? I’m sure that you relished the opportunity to make friends with your garden again, you’ve done so much travelling this year. 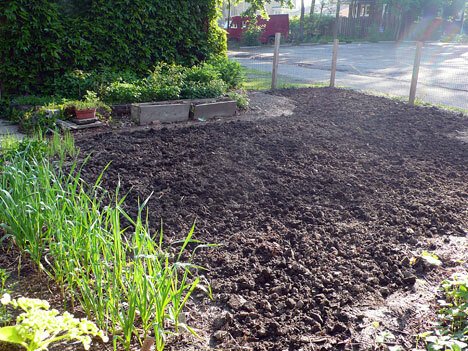 It is hard to explain to non-gardeners the feeling you get from being ‘at one’ with the soil. And so satisfying and exciting when those first tiny shoots start to appear! We’ve had a lot of fun in the Clubhouse while you’ve been away. Can’t wait to see what delights you’ve got in store for us! Good to hear of the success of the club! Not that I doubted in any way, but since I couldn’t do it this year I was hoping it would be succesful enough that you’d consider NEXT year! Your garden is always so lovely and productive. We have next to no sun at our place, so veggies aren’t ever going to be in my garden. 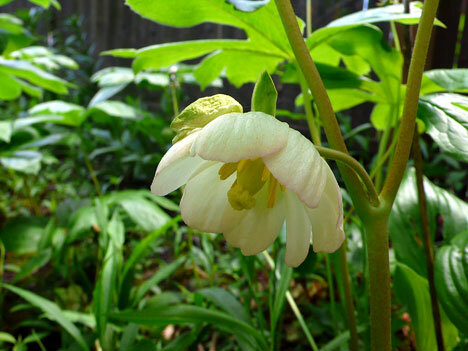 But I’m hoping my shade flower patches come in this Summer! Yay for color! *happy sigh* Embossed stitch socks to top off a long garden post; perfect! I love the gardening, too! I think it’s great to see that knitters are not all one-dimensional. (I know we’re not). But it’s fun to see some secondary interests, too. While I’m not a gardener, your pictures as well as Norma’s pictures have continually inspired me to join our local CSA. I get the benefit of the produce, without the work. 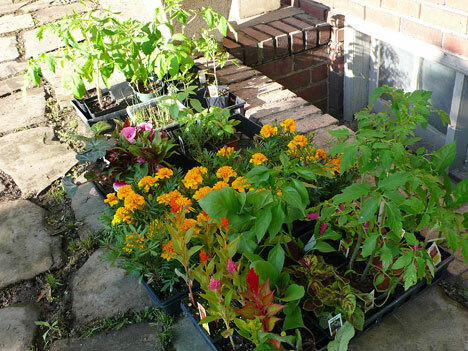 Keep up the great gardening photos – it’s so much fun. Oh – and that sock – it’s already going in my queue. 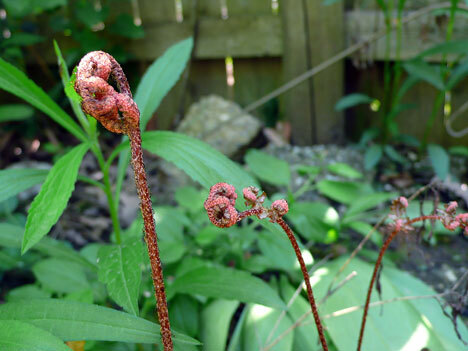 It’s so easy to lose track of time when gardening, isn’t it? How fun to have a ‘blank canvas’ to play with. I hope you have some decent sun soon! Ours has gone away for good I fear. I thought I was the only person who couldn’t grow zucchini…. Wow what an impressive garden you have! 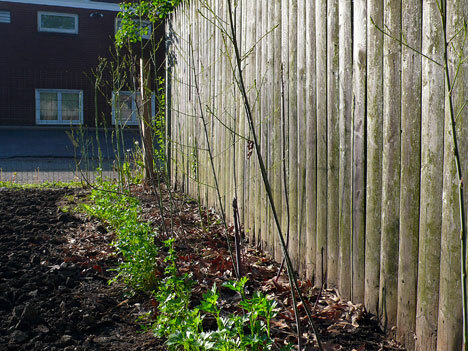 I’ve learned so much from reading about your garden on how to deal with pesky critters! Can’t wait to start my own soon. 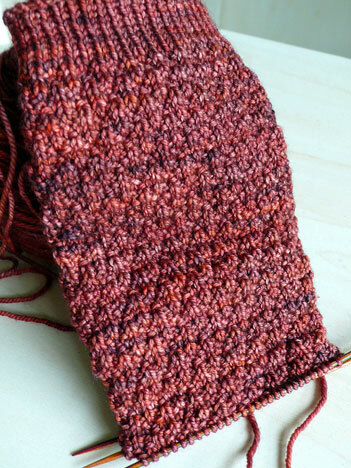 Oh, and I must say that the Sign Of Four socks are turning out beautifully! 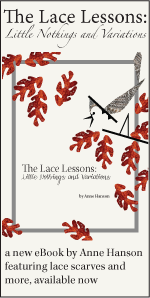 is the lace the one wtih alisha’s yarn? 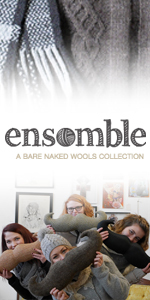 i ordered some and it should arrive any day so i’ll have to hold onto it until the pattern is ready! I love your garden-it puts my 3 tomato and 2 cucumber plants to shame. 🙂 Thanks for the May Apple shots-you reminded me to go out w/Noah and check ours. 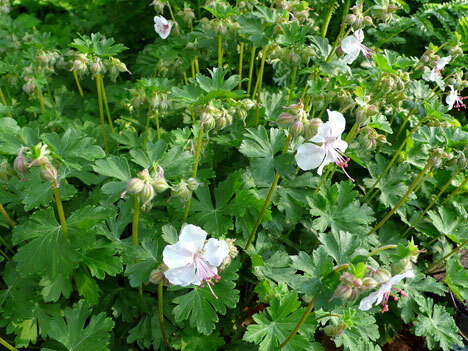 The last time we looked the flowers weren’t ready yet. Your gardens almost make me want to be a homeowner again. Note, I said, almost. I do my best in containers on the patio. So far, so good. Your gut was right, it is a male robin. You can tell because the head is darker than the female’s. If his beak was stuffed with worms, there might be a nest nearby. Lovely garden pictures! I miss the May apple, which doesn’t grow this far north. I’ve lived in Oklahoma so long that gray dirt looks odd to me. My dirt is as red as my hair, hehe. Orange even. 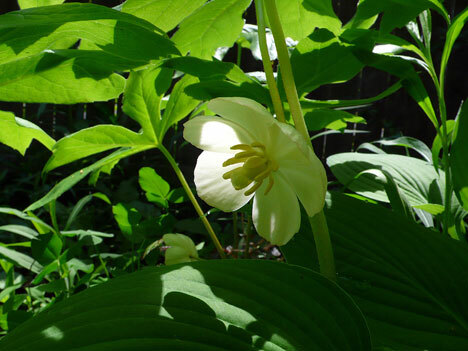 Great garden pictures! Isn’t it lovely to see all the green and flowers? Even with all of this rain, it’s still so much more cheerful than it’s been in so long. You are amazing – after all that work in the garden, I would be dead but you still have the energy to knit. Great work in the garden. What a sweet little bird your American robins are! Quite, quite different to ours! 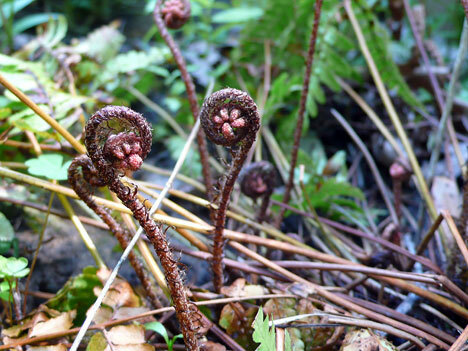 Your garden is so inspiring to see! I’m sure it’ll cause me no end of envy and and make me wish we’d rented a house with a proper yard. As it is, I’ll let it encourage my partner and I to make the most of our sunny deck for pots and of the existing raised bed (if I show him your garden posts I bet it’ll push him into a making a second one). Thanks for all the photo-documenting! Hope to see you in Wooster Saturday – I know I’ll be visiting Chris’s booth!! Hey Anne: What colorway is that in the Caper Sock? I agree Anne, the sweet georgia cashsilk is sinfully delicious. Gasp-worthy for sure. Your garden is amazing, if it evers stops raining here, I may get to see what’s trying to grow among the weeds. I just picked my first quart of strawberries this season- usually I lose the first couple of batches to birds and rabbits but there must be enough food out there from this rainy spring to keep them from raiding! I love root veggies too but on’t have enough sapce to do more than one crop at a time (this year it will be potatoes). Love the gardening updates!